Ditching my car and getting off the grid was one of the best decisions I've made since moving to Los Angeles. Instead of inhibiting my freedom and mobility, it has actually enhanced my quality of life through finding creative transportation solutions by public transit, bicycle and foot. 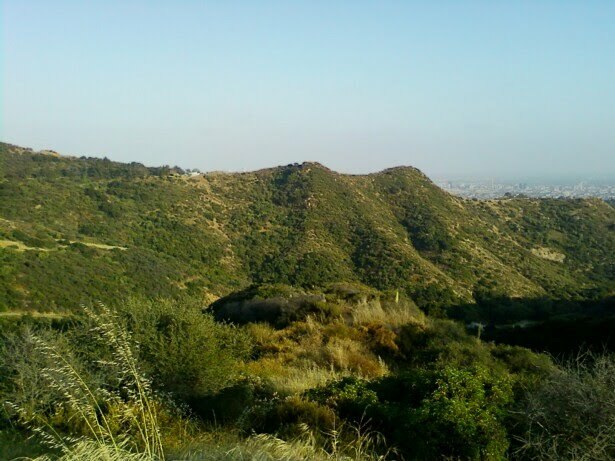 Here are some observations from my first two car-free weeks in Los Angeles. 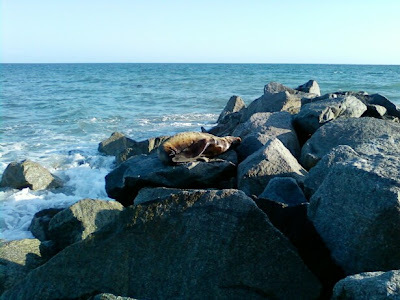 It is amazing what you notice when you aren't revving up the rpms and screeching the tires in your leased BMW. For example, I saw this new eco-friendly development while biking around Hollywood. 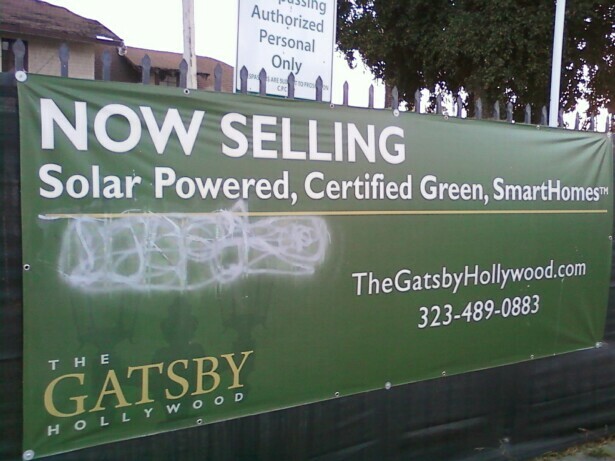 The Gatsby Hollywood website claims that it is metro L.A.'s first certified green, all-solar SmartHome community. In addition to getting energy from the sun, the property will feature drip irrigation landscape areas to capture and retain water run-off, low or no Volatile Organic Compound interior materials and much more. Click here for all the great environmentally friendly features of The Gatsby Hollywood homes. My friend recently moved to the Beachwood Canyon community in the Hollywood Hills so we parked our bikes at his place and walked up to the nature trails that offer spectacular views and natural scenery between the Hollywood Sign and the Griffith Park Observatory. On the way we walked through the historic Hollywoodland neighborhood which was first developed in 1923. 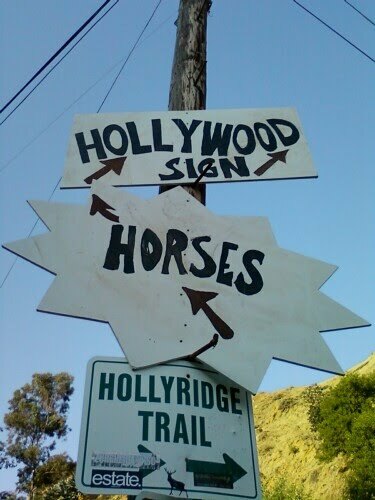 Some people might not know that the Hollywood Sign was built to advertise a real estate development and it wasn't until later that the "land" was removed from the sign. 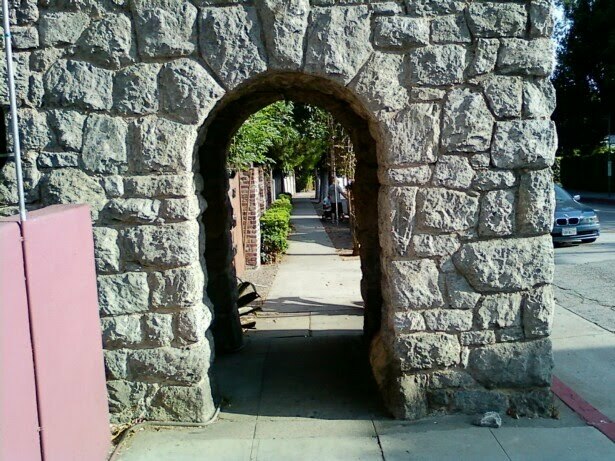 Below is one of the two stone gates that were originally built in 1923 as the official entrance to the Hollywoodland real estate development. Above: One of the original interconnected granite stairs built in 1923 that is used by joggers and brave tourists today. Below are more pictures from Hollywoodland and the area around the Hollywood Sign. 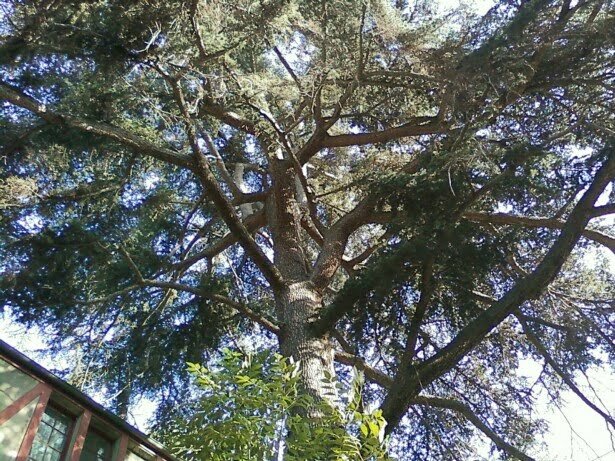 This tree must have been over a hundred years old and the house next to it was built in the 1920s. 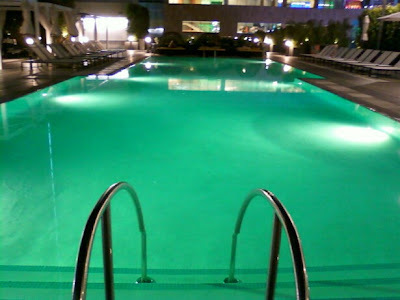 I took the Metro Red Line to Los Feliz to watch Lakers-Celtics Game 7 at a bar on Vermont Avenue. It was fun watching all the purple-and-yellow clad fans riding the subway and bus. 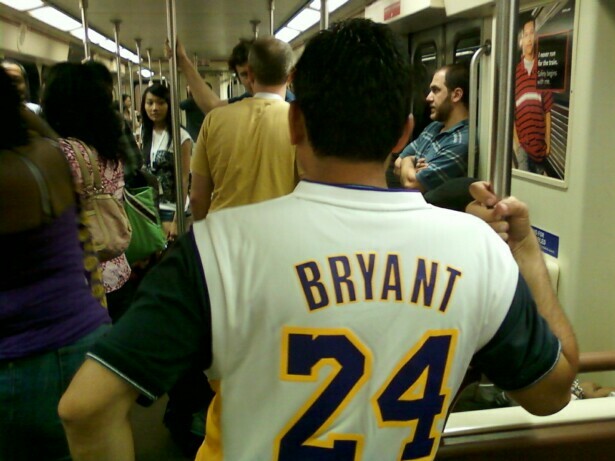 But I did feel bad for a guy in a Celtics jersey waiting for the bus after the Lakers won the championship. He was getting a lot of trash talk from rowdy Lakers fans. 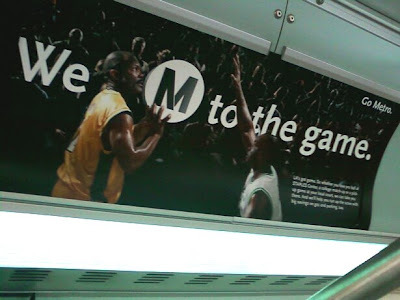 Memo to Metro: If you want to get more people to take public transit to the Laker games, then you are going to have to get one of the actual Laker players on this advertisement. I wouldn't pay to see these two guys play ball. If Corporate America had its own city it would look like L.A. Live. 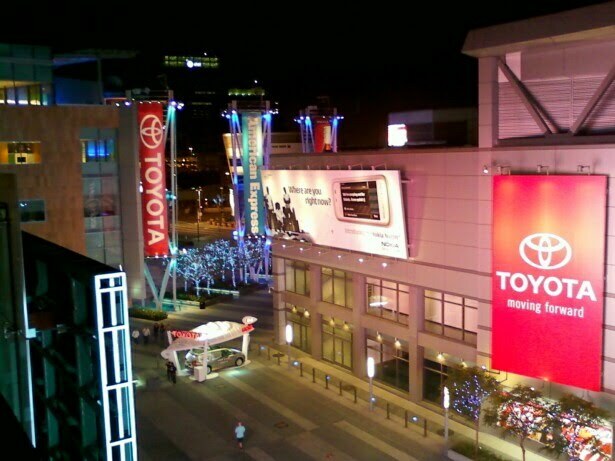 Nowhere in this city are the glaring contradictions between the haves and have-nots more visible than at L.A. Live. My friend and I rode the Olympic Boulevard bus with the worker bees from the Westside to see a screening at the L.A. Film Festival, which moved downtown this year from its usual digs in Westwood Village. The Regal Cinemas at L.A. Live is an interesting location for an "independent" film festival. 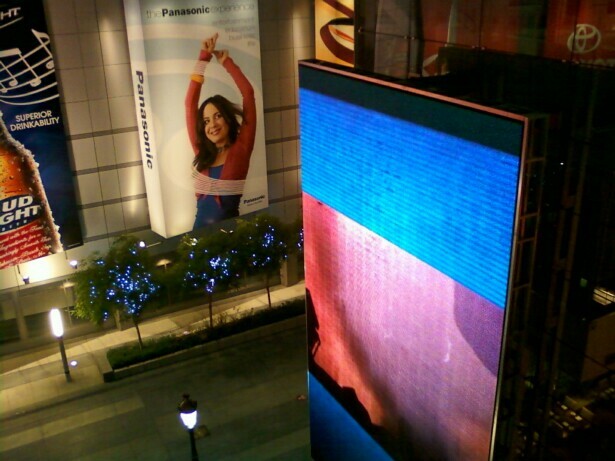 It was surreal seeing indie film buyers and sellers surrounded by giant corporate advertisements as big as the moon. 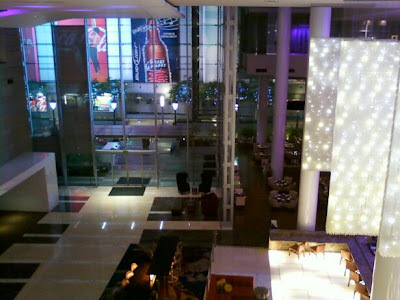 The problem I have with L.A. Live is that it is has no soul and no restraint in terms of plastering advertisements on every blank wall in the area. 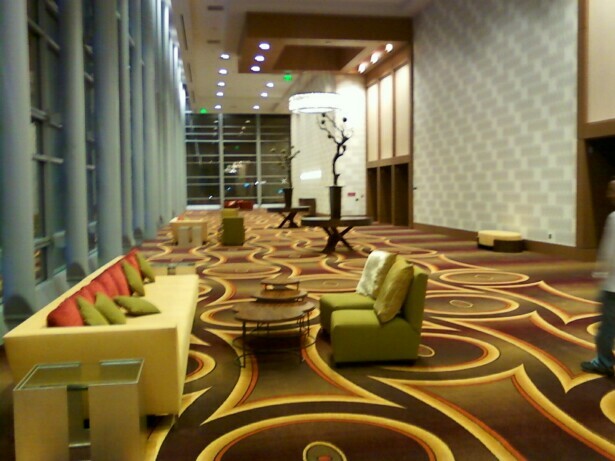 Even the new J.W. Marriott/Ritz Carlton features a gigantic Coca Cola ad on the side of the building. Speaking of, this new humongous hotel is a sight to see. 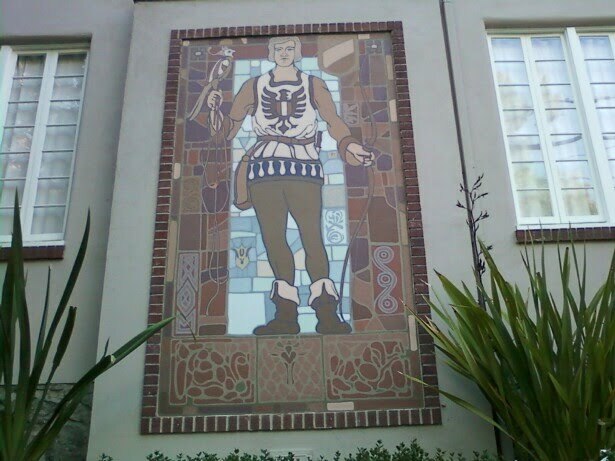 It is wondrous and grotesque and over the top all at the same time. You have to see it to believe it because I guarantee you've never seen a hotel quite like this one. 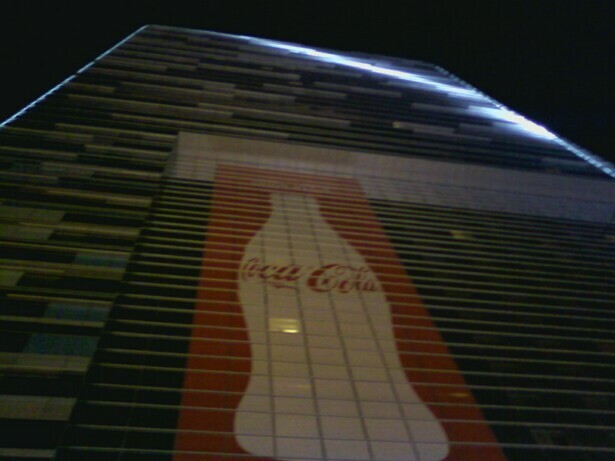 I've been to a lot of surreal places in this surreal city, but the J.W. 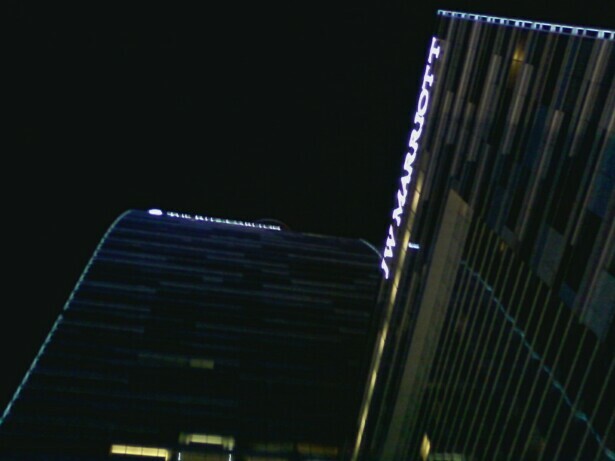 Marriott/Ritz Carlton is hands down the strangest of them all. Here are videos and photos of my trip through the looking glass. 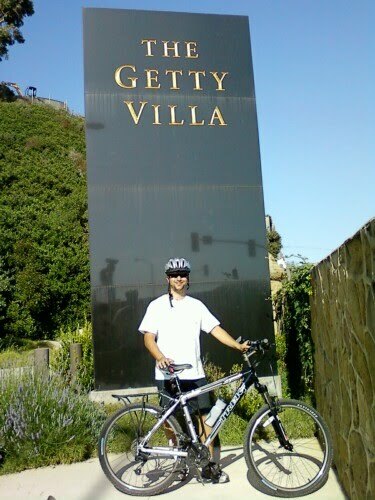 Last Saturday I took a 16-mile bike ride from my apartment in the Miracle Mile to the Getty Villa museum on Pacific Coast Highway in Pacific Palisades. The fact that my friend and I arrived after the museum had closed is another story. But the ride was an adventure to say the least. 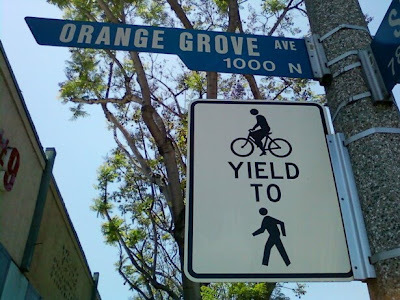 One lesson learned: Do not bike down Sunset Boulevard. 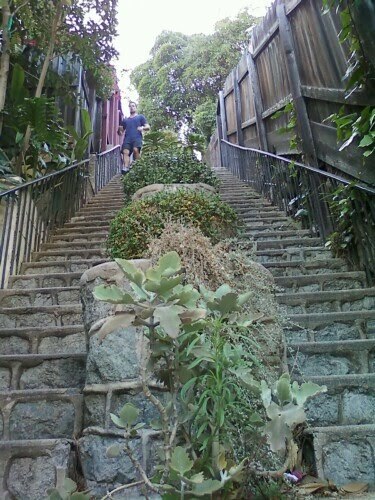 There are many stretches were there is only a very narrow sidewalk or dirt path on one side of the road and the sidewalk abruptly ends on one side and starts up on the other side of the street so you have to cross Sunset which is a risky endeavor with speeding cars coming around hilly corners. I'll never bike down Sunset again and don't recommend it. To start the trip I biked up to the intersection of La Brea and Santa Monica Boulevards in West Hollywood and then biked down Santa Monica. This sign would seem to indicate that WeHo is bike-friendly. 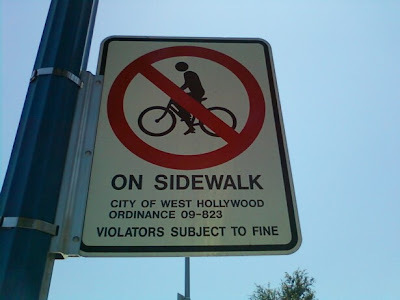 But a little farther west down Santa Monica Boulevard there was another sign that would indicate that this neighborhood is not bike friendly considering there are large swaths of Santa Monica Boulevard that don't have bike lanes. So where is a biker supposed to go when the busy street is dangerous and the sidewalk is off limits? Finally the bike lane started but there is little room for error when you are squeezed between vehicles traveling on your left and cars parked on your right. 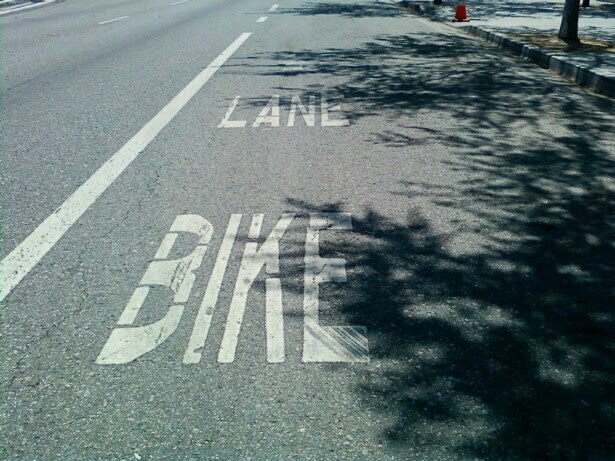 A better model for a bike lane is placing it between the parked cars and the sidewalk. It is much safer. In Beverly Hills there is a great example of how to properly build a bus stop. 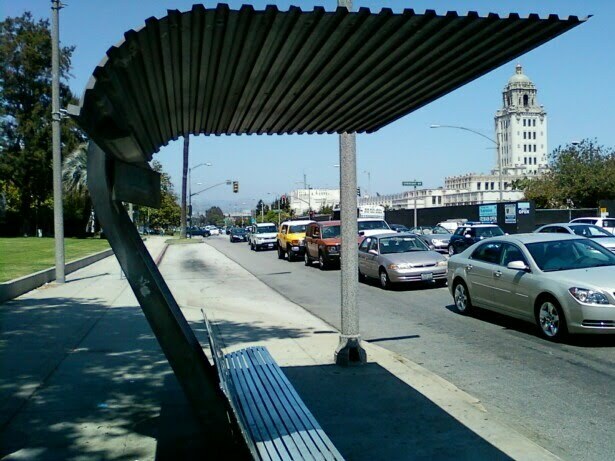 This bus stop provides shade to people waiting on a hot sunny day and aesthetically it is nicely designed, providing dignity to bus riders. After stopping for a picture at the Getty Villa we biked down PCH to Santa Monica and then down Wilshire to Westwood Village before hopping on the bus back to the Miracle Mile. Altogether it was about a 25-mile bike ride. But next time we'll leave earlier so we can actually go inside the Getty Villa. At least we were treated to a rare sea lion sighting while eating lunch at Gladstone's Seafood Restaurant in Malibu.